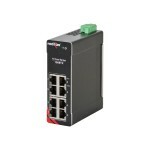 RED LION CONTROLS, an expert in communication, monitoring and control for industrial automation and networking, has announced the addition of the N-Tron series 1008TX unmanaged Gigabit Ethernet switch to its industrial networking solutions portfolio. The new industrial switch, which offers eight 10/100/1000Base-T(X) ports with support for jumbo frames, features an extended operating temperature and wider power input range than most competitive offerings. Red Lion’s 1008TX is a plug-and-play, unmanaged Gigabit Ethernet switch housed in a hardened, metal DIN-rail mountable enclosure designed to provide cost-effective, reliable performance in the harshest industrial environments. Ideal for use in mission-critical data acquisition, security and surveillance, control and Ethernet I/O applications, the 1008TX delivers low latency and high bandwidth to industrial networks. “Faster, high-volume data and video applications are becoming the norm in industrial networking,” said Diane Davis, director of product management, networking at Red Lion Controls.